Beat the eggs with the melted butter. Preheat the oven grill. Position an oven rack in the centre of the oven and place a large baking tray in the oven to warm through. When it’s hot, remove the oven tray and quickly spray with non-stick food spray. Pour the egg onto the tray and return to the oven. Bake for 3 – 5 minutes or until the eggsare just cooked but still moist. 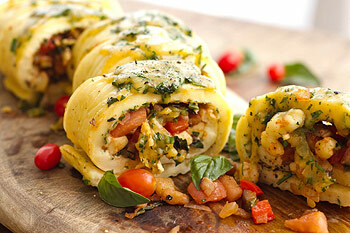 Remove from the oven, sprinkle with the tomatoes, cheese and herbs and roll up (still in the pan) like a Swiss roll. Slice in 4 portions and serve at once. Sift the Sasko Cake Flour with the salt into a mixing bowl. Rub the butter and lard or fat into the flour. Sprinkle about 60 ml cold water over the mixture and begin pulling the mixture together with a pallet or knife. Add a little extra water if the mixture is too dry. Using your hands, mould the pastry into a ball that leaves the bowl clean. Cover with a plastic bag and chill in the fridge for 20 – 30 minutes. Roll the pastry out slightly larger than your baking tin or pie dish. Using a rolling pin, lightly ‘roll’ the pastry over and into the tin or dish. Gently push the pasty into the corners, trim off most of the excess pastry and push up the sides of the pastry to extend and fall outside of the rim of the tin. Prick the base liberally with a fork and brush lightly all over with the egg wash.
Place the tin or dish on a heated baking sheet and bake it on the middle shelf of the oven preheated to 190 ºC for 20 – 25 minutes or until the pastry is crisp and golden. 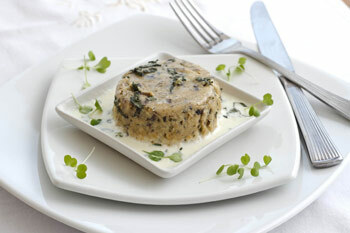 Allow to cool in the pan and fill with any filling of your choice. Cut the top off and hollow out each bread roll. Place a few sprigs of thyme and some Parmesan cheese in the bottom of each hollow bread roll. Fry some cubes of pancetta / bacon/ chorizo sausage or salami until crispy on the edges. Break an egg or two into the roll, depending on the roll\'s size. Top each egg with some cubes of meat and some grated cheese. Season with salt, pepper, smoked paprika or chilli and some thyme or rosemary and pop them onto a tray into the oven preheated to 180 ºC or until the eggs have cooked to your liking. The heat will automatically do its thing with crisping the roll and melting the cheese. Serves as many as you bargained for! Heat the oil and add the mushrooms. Sauté until their juices have evaporated and you’re left with a barely moist, nut-brown mixture. Add the butter and when melted, add the flour and cornflour mixture. Mix well then stir in the milk, whisking until it boils and thickens. Reduce heat and simmer for a minute, stirring all the time. Remove from heat and whisk in the mascarpone or cream cheese. Set aside to cool. Whisk the egg whites stiffly and fold into the sauce mixture. Spoon the mixture into six large ramekins that have been lined with baking paper and sprayed with non-stick spray leaving about one cm space around the top rim for the soufflés to rise. Place them into a baking tray and pour boiling water into the tray until about 2 cm deep. Bake in the oven preheated to 190ºC for 20 – 25 minutes or until firm, golden and puffed. Remove from oven and allow to cool. They will collapse: do not be alarmed. In fact, you can make them hours ahead of serving time. When you are ready to serve, carefully remove the soufflés from their baking vessels and remove the baking paper. Invert them on 6 small, oven-safe serving dishes and place the dishes on a baking sheet. Whisk together the cream and remainder of the basil. Pour over soufflés and bake at 190ºC for 10 – 12 minutes or until they’re puffed again. 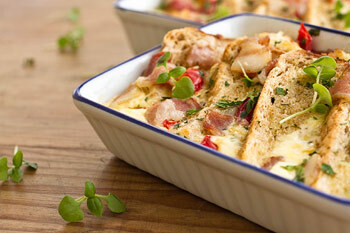 Remove from oven, scatter with micro herbs and serve immediately. Heat a little olive oil in a large pan and sauté the onions until golden. Lower the heat and sauté the onions until very soft and tender, about 20 minutes. Transfer from the pan to a mixing bowl and set aside. Whisk the eggs with the rest of the ingredients and add to the cooked onion. Mix well and pour into the pre-baked pie crust. 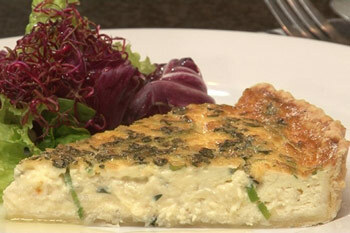 Bake for 25 – 30 minutes in the oven, preheated to 190 ºC, or until just set, but the centre of the quiche still wobbly. Allow the quiche to rest for 10 minutes before removing from the pan before serving. In this resting time, the ambient heat in the quiche will continue to cook the eggs. Blanch the corn in boiling water for a minute, drain and chop coarsely. Transfer to a small saucepan. Add the sauce powder and the milk. Whisk while bringing to a boil. When thickened, remove from heat and cool down to lukewarm temperature. Whisk the egg yolks into the sauce, one at a time. Stir in half the chives and all the cheese. Reserving the rest of the chives. Line 8 ramekins or small baking dishes with baking paper. Grease or spray the paper with non-stick spray. Whisk the egg whites until soft peaks form. Fold into the sauce mixture. Spoon the mixture into the baking vessels; leave about 1 cm room on top for the soufflés to rise. Fill a baking tray about 2 cm deep with boiling water and place the baking vessels into the tray. Bake the soufflés in an oven preheated to 190ºC, for 20 – 25 minutes or until firm, golden and puffed. Remove from the oven and allow to cool in baking vessels. They will collapse: do not be alarmed. In fact, you can make them hours ahead of serving time. When you are ready to serve, carefully remove the soufflés from their baking vessels and remove the baking paper. Let them stand on 6 small, oven-safe serving plates. Whisk together the cream and remainder of the chives. Pour over the soufflés and bake for a second time in the oven, preheated to 190ºC for 10 – 12 minutes or until the cream has been absorbed and the soufflés have puffed again. Garnish with whole chives and serve immediately. Heat a frying pan and add the nuts. Toast lightly and tip out. Set aside. Heat the oil in the pan, add the mushrooms and garlic and cook until the mushrooms are soft. Remove from the heat and stir in the basil and nuts. Season liberally and set aside to cool completely. Cook the spinach as directed on the pack. Drain and squeeze out as much moisture as possible and chop coarsely. Beat the egg yolks and add to the spinach together with 30 ml of the cream cheese. Season and sift in the flour. Mix well. Line a Swiss roll tin with baking paper and grease the baking paper. Whisk the egg whites until stiff and fold into the spinach mixture. Pour the mixture into the prepared tin and bake in the oven, preheated to 190ºC, for 12 – 15 minutes or until it feels firm to the touch. Meanwhile, mash the remainder of the cream cheese and stir in the mushroom and nut mixture. Lay a fresh sheet of baking paper on a board and sprinkle with the Parmesan and parsley. Smartly turn the roulade onto the paper. Spread with the mushroom filling and gently roll the roulade up from one short side to another, taking care not to squeeze the filling out. Serve at room temperature or return to the oven to reheat before serving. Mix the flour and butter into a paste and beat into the butternut. Add the salt, castor sugar, cinnamon, nutmeg and egg yolks and beat well. In another bowl, beat the egg whites into soft peaks and fold into the butternut mixture. Place 6 ramekins or cups onto a baking sheet and spray their insides with non-stick spray. Spoon the mixture into the cups and bake in the oven, preheated to 190 ºC for 20 – 25 minutes or until cooked right through. Remove from oven and serve at once. Heat the oil and lightly brown the onion. Then add the pepper, aubergine and mushrooms. Sauté until translucent then stir in the tomato paste and garlic. Add a little water if needed and simmer for about ten minutes or until the veggies are cooked but not mushy. Season to taste, remove from the heat and set aside until required. Whisk together the Nulaid eggs, milk and parsley. Mix the flour and cornflour with a little of the milk mixture into a smooth paste and stir into the rest of the egg and milk mixture. Season to taste with salt and pepper and pour into a roasting pan lined with baking paper that has been sprayed with non-stick spray. Bake in a preheated oven at 180ºC for 20 minutes or until the egg is set. Remove from the oven and set aside to cool in the pan. To complete, stir the mozzarella cheese and basil into the vegetable mixture and dollop spoonsful of the mixture all over the omelette. Spread out evenly and using the baking paper, roll the omelette around the filling. If the ratatouille mixture is too much for the roll, reserve the left over for an omelette, stew or soup later in the week. Sprinkle the cheddar cheese and parsley on top. Place the omelette roll in the oven for ten minutes or so or until warmed through and the cheese has melted. Remove from oven, slide onto a serving platter, slice and serve. Whisk together the eggs, cream and milk and season to taste. Pour in equal quantities over the bread and cheese arrangements. At this stage, you can cover the dishes with cling film and chill for a few hours or until required. To complete, arrange the bacon and tomatoes over the top and bake in the oven preheated to 180ºC for 15 – 20 minutes or until the creamy egg custard is set and the exposed bread crusts golden and crisp. Remove from oven and serve.